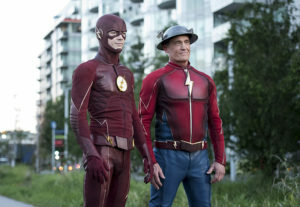 John Wesley Shipp‘s Jay Garrick, the Flash of another world, returns to The Flash with tonight’s episode, “Enter Flashtime,” which promises to be a speedster-filled story in which the fast heroes assemble to stop a detonated nuclear device. 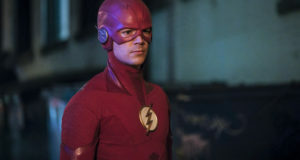 Longtime Flash fans have a special connection to Jay beyond the current series as he was the “O.G. 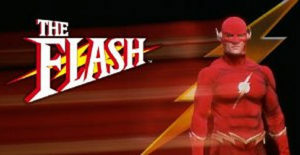 Flash,” Barry Allen, on the original Flash TV series which ran from 1990-1991. 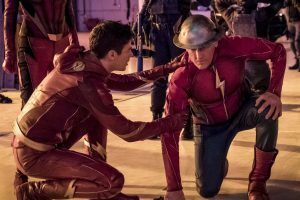 In anticipation of the March 6 installment which airs at 8PM ET/PT on The CW, we spoke with Mr. Shipp about “Enter Flashtime,” Jay, and of course, topics about the Flash legacy. Enjoy! JOHN WESLEY SHIPP: There’s a nuclear device that’s gone off, and we have split seconds to try to figure out a way to keep it from destroying everything. It pulls in all the speedsters – it pulls in Jay’s scientific knowledge, it pulls in Jesse, it pulls in others who are not necessarily speedsters…. we all get together to try to figure it out – as long as we can keep running, which is not limitless. Speedsters have to stop. If we stop, it’s Game Over. While we’re moving in Flashtime, and everyone else is nearly frozen, the rest of the world is moving almost imperceptively, and we’ve got to figure out a solution to this problem, because if we stop and it reverts to real time, it’s over. I never thought that I would ever be in another Flash suit, let’s start there! At the filming of the last episode with Mark Hamill at 5am in Southeast Los Angeles, I ripped the wings off of the suit, threw ’em in the air, and swore I’d never get into another Flash suit! And lo and behold, here I am! I remember Carla Princi, I owe her an apology… she was publicity at Warner Bros. and at one point, she was being so affirming, and she said “this is a role you were born to play!” And I shot back. I said “Oh, God, I hope not!” Simply because I was a young actor at the onset of my career, and there were so many more roles that I wanted to play. It’s pretty bizarre to be back in this whole universe, but I love the concept. Isn’t it brilliant? 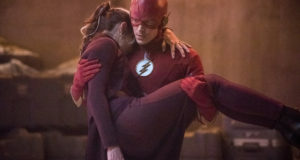 Just the idea and the concept of the [“Enter Flashtime”] episode. Is Jay Garrick’s costume more comfortable to wear than the old one? It’s night and day. I’m sitting in my Jay Garrick suit, and they come up and they say “do you need some water” or “would you like to get out of that?” I’m like “no, this is Christmas! Are you kidding me?” The old suit was so difficult to work in. I give the creators props: It was a work of art, and $100,000 to build four suits in 1990. They were really wonderful, but it was very difficult to work on. It was very hot and you had to glue it to my face, and a lot of things that don’t have to happen now. There’s an undersuit now and an outer shell, so you can peel the leather shell off and they can wash the undersuit, which is much more pleasant for everyone on the set. 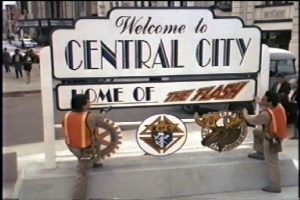 Last week gave us the sad news that original 1990 Flash Executive Producer Paul DeMeo had passed away. Can you talk about him and his role in your Flash experience? I was shocked — it really took my breath away. It really was a sucker punch. I was going down to the subway in New York, and I saw that Danny Bilson had put something up, and I sat down, and I was like “you’re kidding?!? !” I contacted Danny, and I said to him “I can only imagine what you’re feeling,” because for me, it’s like a significant part of my creative, professional life just left the planet, because Paul, of course, and Danny… 28 years ago, they changed my life. I wouldn’t be here talking to you today — not about this — if it hadn’t been a creative decision that they and Warner Bros. and CBS made 28 years ago, for me to play what they call the O.G. Flash. You were just talking about “The Trial of the Trickster.” Wasn’t that Bilson and DeMeo in the final shot with the sign? Yes! It was them, and then I go streaking by in a red flash. Danny put that up on his page, and I put it up on my Twitter page, too. It was a great shot. There’s much more to this interview. You can read Part 2 here!